დაცვის სტატუსი / Protection status: ტერიტორიის 57,73%-ს IBA (GEO11) ფარავს. IBA (GEO11)-ს ტერიტორიის 5,35%-ს SPA 5 ფარავს. / 55.73 % of territory is covered by IBA (GEO11). 5.35% of IBA (GEO11) is represented by SPA 5.
დასაცავი სახეობები / Species of concern: გავაზი (Falco cherrug), ბექობის არწივი (Aquila heliaca), ორბი (Gyps fulvus), ფასკუნჯი (Neophron percnopterus) და წითელი იხვი (Tadorna ferruginea). დავით გარეჯში ბუდობს: 1 წყვილი გავაზი, 1-2 წყვილი ბექობის არწივი; 2-3 წყვილი ორბი; 7-10 წყვილი ფასკუნჯი; 15-20 წყვილი წითელი იხვი. გავაზი საქართველოს წითელ ნუსხაში შესულია როგორც კრიტიკულად საფრთხეში მყოფი (CR). დანარჩენი სახეობები, როგორც მოწყვლადი (VU). გავაზი და ფასკუნჯი IUCN-ის წითელ ნუსხაში შესულია, როგორც საფრთხეში მყოფი (EN), ხოლო ბექობის არწივი – როგორც მოწყვლადი (VU) სახეობები. / Saker Falcon (Falco cherrug), Eastern Imperial Eagle (Aquila heliaca), Griffon Vulture (Gyps fulvus), Egyptian Vulture (Neophron percnopterus), Ruddy Shelduck (Tadorna ferruginea). 1 pair of Saker Falcon (Falco cherrug), 1-2 pairs of Eastern Imperial Eagle; 2-3 pairs of Griffon Vulture; 5-7 pairs of Egyptian Vulture; 15-20 pairs of Ruddy Shelduck breed in SPA 5. On the red list of Georgia Saker Falcon is included as Critically Endangered (CR), and all other species – as Vulnerable (VU). Three of them are included on the IUCN red list. Saker Falcon and Egyptian Vulture are Endangered (EN) and Eastern Imperial Eagle – Vulnerable (VU). ტერიტორიის აღწერა / Description of site: დავით გარეჯი სამხრეთ-არმოსავლეთ საქართველოში, აზერბაიჯანის საზღვართან, ზღვის დონიდან 600 – 900 მეტრ სიმაღლეზე მდებარეობს. რელიეფი ძირითადად წარმოდგენილია არიდული და ნახევრად არიდული ლანდშაფტისათვის დამახასიათებელი ჰაბიტატებით, სადაც შემდეგი ძირითადი სახეობის მცენარეებს ვხვდებით: აბზინდა (Artemisia lerchiana), Alyssum desertorum, შვრიელა (Bromus japonicus), ნაცარა (Filago pyramidata), მზეყვავილა (Helianthemum salicifolium), წიწმატელა (Lepidium vesicarium), ნამგალა (Lolium rigidum), ბოლქვიანი თივაქასრა (Poa bulbosa), Artemisietum botriochloosum, ყარღანი (Salsola dendroides) (Kvachakidze 2010). ორნითოფაუნა იხილეთ http://aves.biodiversity-georgia.net / David Gareji SPA is located in the southeastern part of Georgia at an altitude 600 – 900 meters. 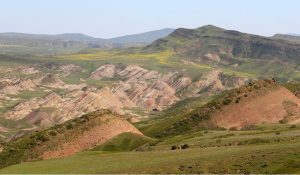 Habitats of David Gareji are mostly arid and semi-arid with following dominant species: Weber (Artemisia lerchiana), Desert madwort (Alyssum desertorum), Japanese brome (Bromus japonicus), Redsteam filaree (Erodium cicutarium), broadleaf cottonrose (Filago pyramidata), Rock rose (Helianthemum salicifolium), Peppergrass (Lepidium vesicarium), Ryegrass (Lolium rigidum), Bulbous bluegrass (Poa bulbosa) (Kvachakidze, 2010). See http://aves.biodiversity-georgia.net for Avifauna. მეთოდის აღწერა / Description: მობუდარი წყვილების დასათვლელად და ბუდობის წარმატების შესაფასებლად მინიმუმ ორი საველე ექსპედიციაა საჭირო. ექსპედიციის დროს ბუდეებს აღმოაჩენთ და თითოეულ ბუდეში ბარტყების რაოდენობას დაითვლით. აღრიცხვის თარიღს, ბუდეების GPS კოორდინატებსა და ბარტყების რაოდენობას ჩაინიშნავთ. მეორე ექსპედიციას ბუდობის წარმატების შესაფასებლად განახორციელებთ. ბარტყებს ხელმეორედ დაითვლით და იმავე ბუდეზე პირველი ექსპედეციის დროს აღრიცხული ბარტყების რაოდენობას შეადარებთ. სახეობები, ექსპედიციების დრო და საბუდარი ადგილების აღწერა იხილეთ ცხრილ 1-ში. / At least two field expeditions are required to count nesting pairs and to assess breeding success. During the first expedition, nests should be discovered and nestlings should be counted. Date of the field expedition, GPS location of the nest and number of nestlings should be recorded. During the second expedition, the breeding success should be assessed, by counting number of chicks in the same nests, which were discovered during the first expedition. Species, expedition dates and nesting habitat description see in table 1.
მეთოდი / Method: მობუდარი წყვილების პირდაპირი დათვლა / Direct count of nesting pairs. მეთოდის აღწერა / Description: შავარდნები ძირითადად ციცაბო კლდის ხვრელებში და გამონაშვერებზე ბუდობენ. ჩვეულებრივ, ბუდეები კარგად არის შენიღბული, ამიტომ ბარტყების დათვლა რთულია. გავაზის აღრიცხვისათვის ყველაზე კარგი პერიოდი აპრილის მეორე ნახევარია. საველე გასვლისას ბუდეებს იპოვით და მობუდარ წყვილებს დათვლით. აღრიცხვის თარიღს, ბუდეების GPS კოორდინატებსა და მობუდარი წყვილების რაოდენობას ჩაინიშნავთ. / The most falcon Species breed on the ledges of the cliffs or in the cavities of rocks. Usually nests are well concealed. Therefore, counting chicks is challenging. So, the best periods for field expeditions to monitor saker falcon is second half of April. During the expedition falcon nests should be discovered and breeding pairs should be counted. Date of the field expedition, GPS location of the occupied nests and number of breeding pairs should be recorded. მეთოდის აღწერა / Description: ყოველწლიურად მინიმუმ ორი საველე გასვლას ახორციელებთ. მობუდარი წყვილებისა და ბარტყების დასათვლელად პირველი საველე გასვლას მაისის პირველ ნახევარში გეგმავთ. მას შემდეგ რაც ბარტყები გამოიჩეკებიან, ისინი მშობლებთან ერთად ტბაზე ჩნდებიან. ამ დროს ისინი ადვილად შესამჩნევები არიან და შესაბამისად დათვლაც უფრო მარტივია. მეორე საველე გასვლას, მოზამთრე ფრინველების დასათვლელად, იანვარში ახორციელებთ. აღრიცხვებს შემდეგ ტბებზე ატარებთ: ჯიქურები, სახარე და კაპატაძე (რუკა 1). / At least two counts should be performed annually. First field expedition should take place in the first half of May to count breeding pairs and ducklings. After ruddy shelducks hatch, parents with their duckling appear at the lakes. For this time they are well visible and are much easier to count. Second field expedition should take place in January to count wintering birds. 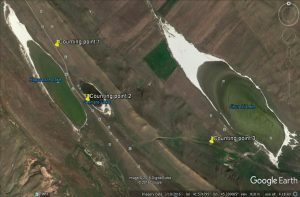 In both cases Ruddy shelducks should be directly counted in Jikurebi, Sakhare and Kapatadze lakes (map1).